The picture you see was made during a trip to the Sea of Japan. From this trip were brought a lot of photos of the night, and this picture is essentially the beginning of the “photo-shoot for the night landscape”. On the first night, instead of sleeping (which was logical after the daily waking in airplanes and cars), we went to the nearest beach for test shots. And I should mention that the conditions for photographing the stars were not perfect. However, it was time of new moon and we did not want to miss the opportunity. Especially when the weather is favorable to you, you need to use it. There is a rule: if you are too lazy to get out of the house, the next few weeks sky will be overlaid by clouds. 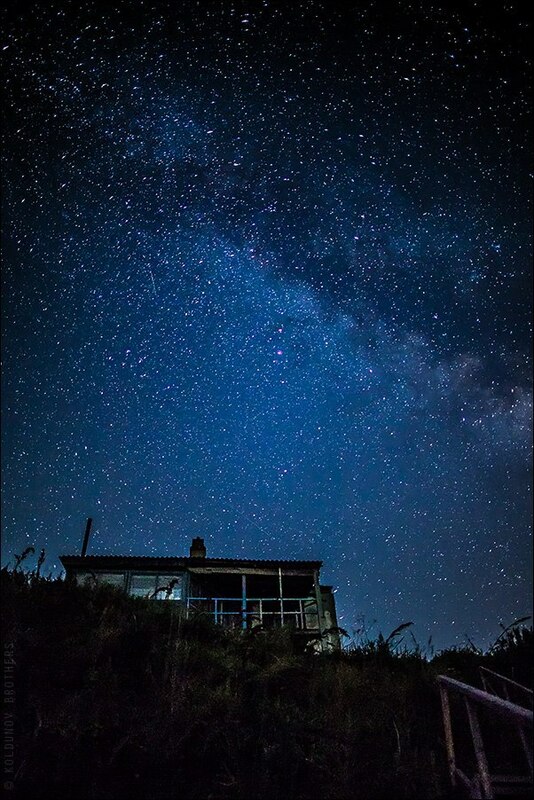 We think that if photo includes not only stars but also a piece of landscape, it looks more impressive. That is why we run down to the water and at the end were satisfied by the results.